So, today I’ll kick off this new year for ShawnsPlate with a few tweaks & changes(hope you like ’em) and a post just like my very first post, treats for Alyson’s lunch. Last year it was Coconut Sandwich Cookies for Alyson. This year it’s Chocolate Snack Cakes with Coconut Filling for Alyson. Although they look like it, they’re not true Whoopie Pies. 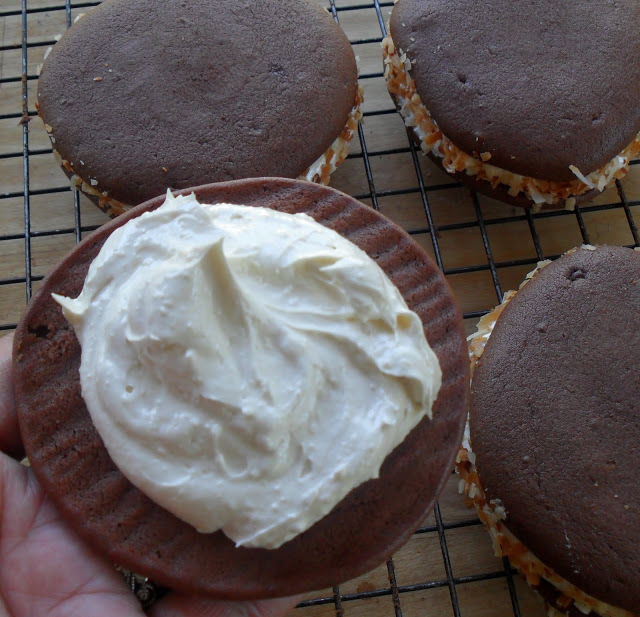 I learned that Whoopie Pies are all about the filling…Crisco & confectioners sugar to be exact. These rich little cakes are filled with that delicious cooked buttercream that I posted last week. 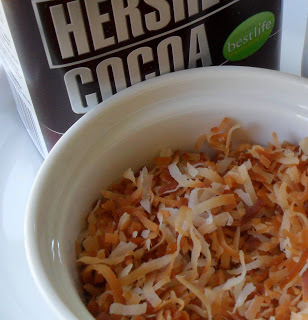 I’ve added coconut extract and dusted the edges of the snack cakes with toasted coconut. Starting with one of Alyson’s favorite flavor combinations. 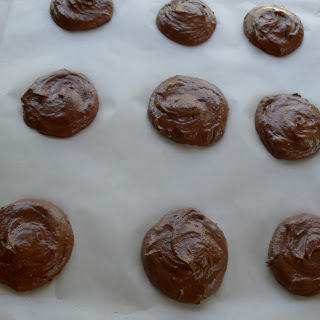 After mixing butter, sugar, egg, and melted chocolate, alternately add dry ingredients with sour cream & milk. Use a small ice cream scoop to drop mounds of batter on parchment. Sandwich coconut buttercream between cooled cakes & dust filling with toasted coconut. Preheat oven to 350 degrees. Place semi-sweet chocolate in a shallow dish and cover with boiling water, stir until blended and set aside until cooled and ready to use. Sift together flour, cocoa, baking powder, and salt and set aside until ready to use. In a bowl, cream butter and sugar until light and fluffy, about 3 minutes. Beat in egg until well blended. 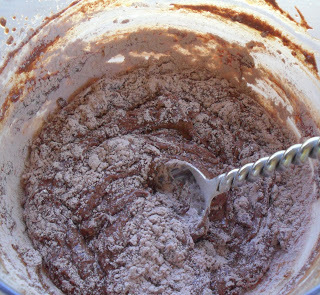 Stir melted chocolate and vanilla to egg mixture. Stir sour cream and milk together and alternately add to chocolate mixture with flour mixture until everything is mixed in. Line a cookie sheet with parchment. Use a 1/4 cup ice cream scoop to drop batter 2 inches apart on parchment and flatten slightly. Bake for 10 minutes. Transfer parchment sheet to a wire rack and allow cakes to cool for 5 minutes before removing from parchment. Allow cakes to completely cool before assembling. To assemble: Stir coconut extract into buttercream. Drop a tablespoon of buttercream onto the flat side of 5 of the cakes. Top each with remaining cakes to create sandwiches, press lightly to spread buttercream to the edges. Coat the exposed buttercream edges with toasted coconut. Congrats Shawn! I absolutely adore “Shawn’s Plate” and your recipes. Your cookies look delish, especially with that coconut filling. Ciao, mi unisco a quello che visitano il tuo blog perchè è veramente bello, anch’io voglio provare i tuoi biscotti! Un saluto dall’ Italia! I know you did not just go and post this after I have a months worth of cookies stashed in my pantry! I got on a cookie high yesterday but seriously this has to be made like right now! Absolutely delicious and the perfect thing to celebrate your first blogversary! Love it Love it! Love it! @Anna & Liz…Thanks, my folks have already requested another batch! @Jessica…Thanks! If you love chocolate, this one is for you! P.S. When you’re pregnant, is there really a such thing as too many cookies?! Love your twist on the whoopie pie and congrats! Congrats on your blog 1st Anniversary….. Such a beautiful blog you have here. Congratulations on your anniversary! I love your blog, Shawn, and you are always cooking up something I want to eat (and I reeeeealllly need to go on a diet, so stop it! Wow congrats on your 1st blog anniversary! That’s a big milestone and I am really happy for you. I love this coconut filling. I know I won’t stop eating these once I start…. I always love your recipes and keep them coming! 😉 Congrats again. 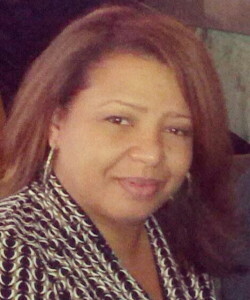 @Reem…Thanks, that’s such a great compliment, coming from someone who had such a lovely blog! @Sarah…Thank you…Maybe your vanilla sponge cake with guava cream cheese filling rivals chocolate & coconut Congrats to you on your upcoming big day! Oh I so appreciate you thinking of me though I’ve clearly fallen off the face of the planet (and, in truth, don’t know if I’ll ever return to blogging full-time). Congratulations on your one-year anniversary. These cakes look divine – I may have to make them this week. To celebrate, I plan to make your pan-seared chicken with lemon, garlic, and capers for dinner!! 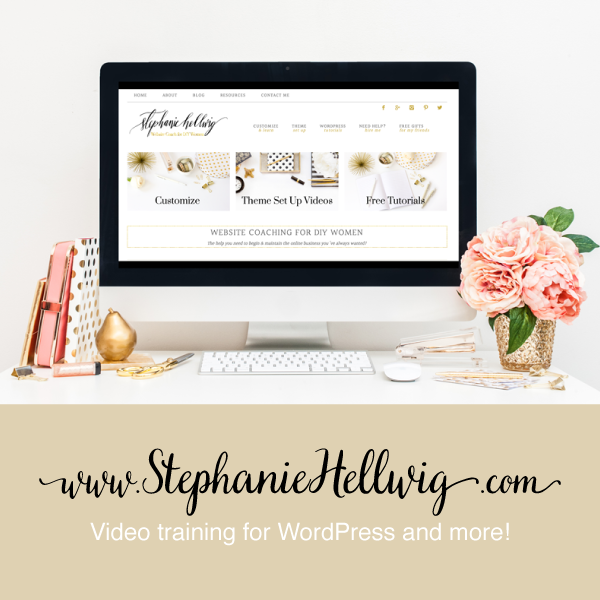 Congratulations–I love your blog so much and we love so many of the same things! Cakes look amazing and delicious, another way to fatten me even more!